You’ve been talking to people all day and not one of them has noticed that you’re currently using Invisalign. One of the best parts about it is that you can go about your life without distracting and uncomfortable orthodontic work in your mouth. You know eventually you’ll look in the mirror and see a perfectly straight smile. Until then, what is the best way to keep your teeth aligners clean? Dr. Daniel Weldon has 5 tips to keep your Invisalign in Ocala, FL spotless. Whenever you take your aligners out, be sure to rinse them with warm water. Saliva and plaque can easily gather in them and create the ideal environment for bacteria to breed, which can damage your teeth and stain your aligners. Be sure to soak your aligners every day in a solution like Denture Cleaner, Retainer Brite, or the Invisalign cleaning crystals in order to sanitize them. Most people choose to soak them in the evening. Avoid just leaving them out, as this can expose them to more bacteria and even lead you to misplace them. Make sure to brush and floss every day, especially before you put in your aligners. Any leftover plaque on your teeth can become trapped by the aligners and make it much easier to cause tooth decay and bad breath. Plaque and bacteria can build up on your aligners, and it needs to be brushed off just like your teeth. Be sure to brush them gently so you do not damage your aligners. You may even want to invest in a soft bristled brush. Use a clear anti-bacterial soap, as colored soaps can actually stain your aligners. Regular toothpaste (especially those with whitening properties) can be very abrasive and may actually scratch them. These scratches can create areas for plaque and bacteria to gather. You can ask your cosmetic dentist in Ocala, FL to recommend what you should use to clean your aligners. Only drink water and don’t eat while you have your aligners in. Chewing can actually change their shape and even damage them. Plus, many foods and drinks can stain and discolor your aligners, and can easily become trapped within them. The closed-off, damp environment is perfect for bacteria. 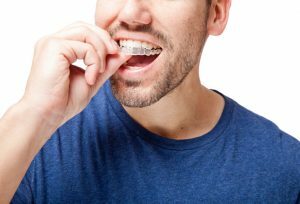 If you’d like to know more about what you can do to keep your teeth and Invisalign aligners clean, please give your dentist in Ocala, FL a call today. Invisalign is one of the best orthodontic treatments available today, and with a little maintenance, it’ll give you a straighter smile in no time.